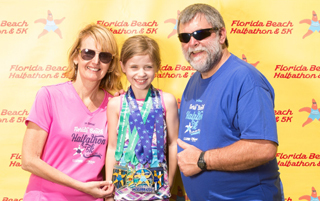 Led by husband-wife team, Chris and Rya Lauber, Florida Road Races is a family-owned and operated race management company that organizes running events in the Tampa Bay area. Founded in 1979 to promote Jet Ski racing, our current mission is to offer the most “runner-friendly” races while promoting a healthy, active lifestyle, showcasing our beautiful beach communities, and generating a positive economic impact. Starting with our first Jet Ski race in 1979, and just 9 local racers competing on our company-owned Jet Ski, we were pioneers helping to grow that sport over our 120+ Jet Ski race promotion career. We peaked in the early 90’s with 275 racers, national-level sponsorship from Anheuser-Busch (5 years), ESPN coverage (5 championship races), and more than $1,100,000 awarded in prize money. Chris’ 20-year career resulted in him being inducted into the International Jet Ski Hall of Fame in 2011. We transitioned to road races on January 23, 2000 with the creation of our Gulf Beaches Marathon, adding the Holiday Halfathon in December 2002, our Halloween Halfathon in 2009, our Florida Beach Halfathon in 2010, and our Ft. De Soto 15K in 2015. Starting with nothing more than a blank piece of paper nearly 20 years ago, a vision, and tons of hard work, we now host 5 races per season, all in Pinellas County, with a current average of 1,200 finishers. For the last two seasons, we hosted more than 6,000 total finishers each year, with runners coming from all corners of Florida, 45 states and 15 countries. Our mission is to challenge athletes to achieve goals they once thought impossible, such as completing their first 5K, setting a personal record, or finishing a half marathon or marathon. Our goal is to provide affordable, well-organized road races that offer the highest level of customer service and satisfaction. post-race celebrations featuring ice cold beer, hot homemade pasta, fruits, pastries, soft-drinks, live entertainment, and awards presentation. We live by the motto “People over profits” with the belief that treating athletes fairly will keep them coming back, ultimately building our races. Besides, it’s the ethical, morally-correct way to build long term friendships. Florida Road Races gives back to the community in various ways. Our Entry-Fee Assistance Program allows financially-challenged athletes to run in our races for free. We donate to local charities, churches, schools and track teams who volunteer at our races. Most important, we offer our time and experience by directing races for non-profit organizations to help them achieve their fundraising goals. E-mail: info@flroadraces.com or the form below. We’re located in the beautiful Tampa Bay area, staging races in St. Petersburg, Fort DeSoto Park, and Madeira Beach to Largo.